Gilroy, CA: Bring on the garlic! Where can you find 10 tons of beef, 4 tons of pasta, 4 tons of calamari, 2 tons of scampi and 2 tons of Christopher Ranch garlic? 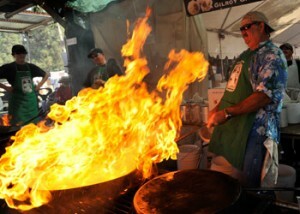 At the Gilroy Garlic Festival, of course! The 32nd annual ultimate summer food fair includes three days of incredible food, arts and crafts, live entertainment and the return of Top Chef sensation, Fabio Viviani. The event will be taking place on Friday July 23rd through Sunday, July 25th and is being held at Christmas Hill Park in Gilroy. Advance tickets are available online until July 22nd. Don’t miss out on the fun! Spend the weekend eating delicious garlic infused treats and celebrating the best of Gilroy! Visit the Gilroy Garlic Festival web site for more information.